Optimizing for local search is no longer optional for most businesses; it’s mandatory. If your business depends at all on how close you are to your potential customers, you must make sure your local business profiles are claimed and up-to-date. In part I of Local Online Search, we outlined steps to get started checking the status of your local listings, what info you should have on hand to correct and beef them up and how to navigate what can often be a frustrating process. In this post, we’ll discuss tips for listing optimization as well as go into a little more depth about how local search works. The first thing you have to understand: local search results will depend on location. Where the user is located or what location the user is interested in searching will be taken into account when the search engine or other local directory returns results. Therefore you must accept the fact that just because you see your listing at the top of the results does not mean everyone does. That is how it is designed to work. Google especially, is smart and adept at presenting the search results it feels is most relevant to the searcher. Since Google is still numero uno for search, most of our examples will be based on it. Then of course, a user may actually type in a location they are interested in searching within. 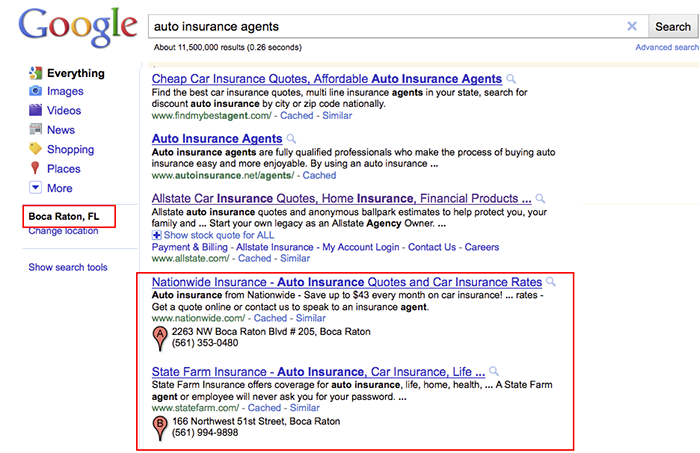 Note the differences in search results seen when searching for an auto insurance agent. If I just search for “auto insurance agent,’ Google suspects but is not certain that I want agents in Boca Raton, FL (my default location). 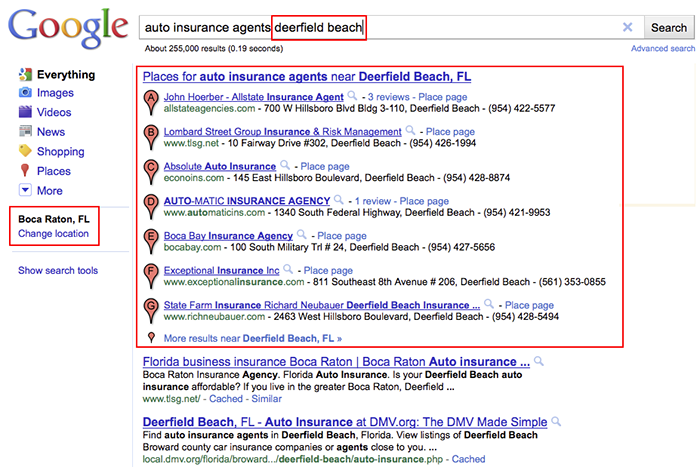 If I add the words “Deerfield Beach” to my search, then Google knows for sure that I want agents near Deerfield Beach and returns those results in a tidy list at the top of the page. Disclaimer: in both of the above examples, paid listings were removed at the top of the page for illustration purposes. On Google Maps, consequent search results will also depend on previous searches during the same session. Now that you understand that smart search engines and user settings can affect what a user sees, it’s time to understand what you can control. Local search seems to rely on local information that is consistent. As of now, it appears that the more places your business is cited across the web, the more likely you are to rank closer to the top of the search results. Keep your business address consistent. We have found that making sure every listing added or altered has the local address written exactly the same way can help the search engines and local directories to recognize with no uncertainty that yes, these two listings represent the same business. So for example, I would want to avoid having some listings show my city as “Delray” and some as “Delray Beach.” I would want them all to show my listings as “Delray Beach.” Certainly this is not a hard and fast rule and search engines are smart enough to recognize variations of a city name with the same zip code, but why take the chance? Likewise ensure the local information on your website is consistent with your listings. Use a local phone number if possible. Area codes still designate locale so be sure to use the local phone number that matches up to your business address. Many listings allow for additional phone numbers, so you can usually include a toll free or alternate cell number as well. Just be sure it’s the local number that is primary for the listing. Multiple business locations require multiple listings. If you have multiple places of business, you can have a listing for each address (P.O Boxes don’t count). Create a special location page for each office that includes the address and phone number just for that location. You might also include other information that is unique to that location such as the office staff, specific services or brands, nearby places of interest, etc. Tailor it to the location and consider pointing your local listing, especially a Google Places listing, to that page. Make your company name count. If possible, include what you do within your company name. For example, we could list our company as Juicy Results or we could list it as Juicy Results Internet Marketing. We can do this because, we are indeed an Internet Marketing agency, our site is optimized for this term and we do not look like we are keyword stuffing. We would not want to list ourselves as Juicy Results Website Design, SEO and Internet Marketing Agency of Boca Raton. That looks like keyword stuffing. Google frowns on including location information in your business name unless it really is part of your legal business name. Include keyword rich, helpful information in your company descriptions. Limited space means you should leave out the market-speak and only include copy about the services or products you provide—anything concrete that someone might search for. So in the case of Juicy Results, we might want to include keywords such as SEO, PPC and website design along with Internet marketing. It is helpful to repeat keywords used in your company name in the company description or list of services/products. Include a photo(s) and reviews. We have seen first hand that at least with Google Places, it does matter. However, never submit reviews on your own behalf and never hire a company to submit fake reviews. Real clients must submit real review with real accounts. Yelp will find it suspicious if all of a sudden your business listing goes from zero to sixty with reviews. Be smart. If something you are about to do feels a little smarmy, then it probably is. First determine who your competitors truly are. Search like a real user, using a mixture of keywords and location information. Do these searches both as a regular Google search and as a search directly through Google Maps. Instead of searching for your company name, pretend you don’t know who you are but are looking for your type of business within a certain geographical region. Do this enough, and you will probably see some of the same names floating to the top of the results. Now, reverse engineer what your competitor is doing. Do they have more reviews, a better optimized company name, a video? What keywords do they have in their company descriptions? Next, Google their name. Where are they getting links from? Everywhere an address and a company name match up is a vote of confidence to a local listing provider (especially Google) that the listing they have is accurate and relevant. Finally, try to get links and listings in the same places as your competitor. Simple enough concept but we warn, it can be tedious and trying. When doing this though, remember to space out this “linkbuilding.” so that no red flags are raised in the search engines. We recommend attacking 5 or so a week. Good article. Answered a lot of my questions. One thing that I have been trying to figure out is if a landline local number is worth the money over using a cell phone that is dedicated to my business. I provide a service so I am only in an office 30% of the time and that is usually at night. But would a landline be worth it just to have the presence of an “office” online, searches and in the directories that are still in print, although probably won’t be around too much longer as you were saying. I just can’t see a landline justifying the cost unless it makes a big difference in local search engines. Once I bought a number sure would be hard to let it go. Comments? Thanks. Interesting question. I am assuming you are worried that the cell number won’t always match the area code of your business but you won’t want to change the cell phone number if you don’t ever have to. I can’t with 100% scientific certainty say that it will make a huge difference to have the landline or not. If your cell number has the area code of your physical location, then I wouldn’t go with a landline. If it doesn’t then you might want to look into a virtual number – they type you can get very inexpensively from Skype. That’s what we do here at Juicy. We have an 800 number we give to our clients and anyone else that wants it, but we use our local Skype numbers in our listings. Personally, I believe area codes will become less and less of an issue with people holding onto cell phone numbers that are no longer indicative of where they live or work and online phone services that let you keep a number no matter where you are. Hope that helps. If I didn’t answer your question, please post back.